technology advancing faster than the human mind. The link to the paper is here. For those with a thirst for knowledge and detail, please go ahead and read it. For general readers, please continue reading! This post is not to discuss the credibility of the model or criticise the article. Instead let us have a discussion about how watching television and/or listening to the radio frequently may affect our communities. Social capital in this context does not directly mean intelligence, but instead the idea of community awareness, trust, governance and social group settings. 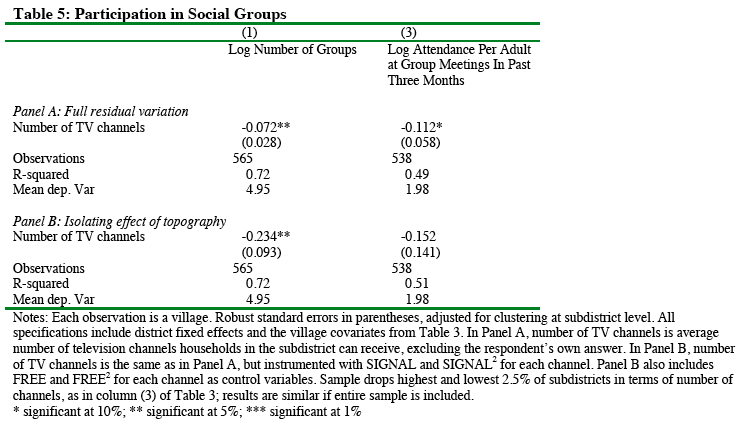 The article presents findings that there is a negative correlation between an increase number of television and a social community in Indonesia. As the number of TV channels increase, the number of social groups reduce. [On average, for every 1 more channel of TV increase, leads to a 7% reduction in social groups (Statistically significant at a 5% level – for you econometricians).] What does this mean exactly? -well, isn’t in logical? the more time you spend watching TV or listening to the radio at home, the less time you are going to spend in external social groups! After all, we only have 24 hours in a day! Thus it is imperative that we consider how much time is spent watching TV and listening to the radio. Or in retrospect, how much opportunity cost has been incurred on your social life for every extra one hour spent in front of your black box. If you are still reading by this stage, perhaps this table may also interest you. The author extended the realm to religious and non-religious groups as well! The results were consistently negative as well. With all this said, causality is not affirmed here, however, correlation is apparent. The notion is a negative correlation between TV/Radio and social capital is very much logical as well. Is it not apparent that over decades, our devices become our ‘social group’ and we tend forget community awareness and values that come alongside with it. For instance, YOU. You are sitting right in front of your screen reading this post, as much as I am sitting here writing it. -to some extent we are secluded from the physical community beyond the parameters of your surrounding. -do you think social capital is important? Do you think that perhaps we should just shut off the screen and reinstate the previous norms of community values that bring trust and belonging? What is the value of your social capital?